I love IPAs. I’m also a firm believer that some of the best IPAs in America come right from Washington state. The Washington IPA Challenge is going to be a chance for some of our favorite WA IPAs to go up against a selection of great IPAs from around the country, as well as against each other. I’m also an advocate of blind tastings/judging. It is tough to truly measure up a beer when you are influenced by your preconceived notions of what it is and should be just based on its label. The first part of this challenge is a blind tasting where select judges will determine the best IPA and Imperial IPA out of a stellar lineup of submissions. Judging will take place on Saturday, August 22. We have some great breweries on board for the challenge, and the judges will have their hands full picking a winner. IPAs and Imperial IPAs will be judged separately. At the end of the day, they’ll determine whether a brewery from within the state keeps the Washington IPA Challenge crown, or if an out-of-state brewery can steal it away. Full results will be announced after the competition. The second part of the challenge will give consumers the chance to taste a selection of IPAs and rate them blind. Beveridge Place Pub will host a blind IPA tasting from Noon to 5pm on Saturday, August 22 that will determine the winner of the Customer Favorite award. Beveridge Place will have up to 14 IPAs on tap that you will be able to order and rate blind (sample sizes will be available). This is a great opportunity to test your taste buds and see if your favorite IPA in name really is your favorite IPA. So, get on out to BPP that Saturday and drink some IPAs! A big thanks to Gary and company at Beveridge Place Pub for helping us out with the challenge. If anyone has questions, feel free to shoot me an email or leave a comment. 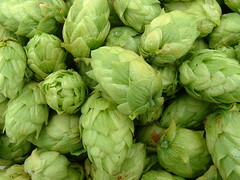 Thanks to sequoianorcal on Flickr for that awesome close-up photo of hops. Congrats on this event. I look forward to seeing what the results.